How to register on this site to use the website template. 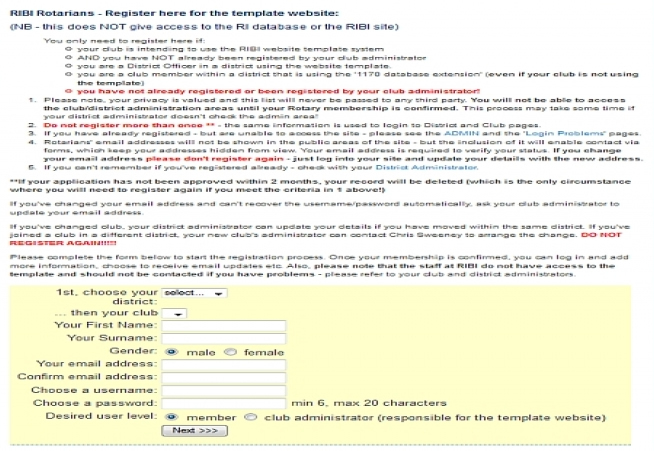 If your club uses the Templare for its website then it is probably best to ask your club secretary or web admin to register you. This will avoid it being done twice and in any case the secretary will have to confirm that you are a Rotarian. Before you can access the members area of the website you must be registered on the template site. If you are the club web adminisrtator and are just starting to use the template, please first ask you district web administrator to register you. If neither of the above apply then please follow the instructions and ONLY REGISTER ONCE - this is NOT the login page to get to your club site! Nobody has access to any area of the site until their Rotary membership is confirmed. When you have completed all of the fields on the form above click on the "Next >>>" button. You should take note of the Rotarian you should contact to confirm your membership then click on the "Click to complete registration". If your district has not appointed an administrator then validating your membership may take some time. Unless you are a current club president/secretary or RIBI Officer I have no way of checking whether you are a Rotarian or not, as I use the current RIBI directory to check. So please be patient! Login is the next section.